Take a look at the pictures of this stunning car. 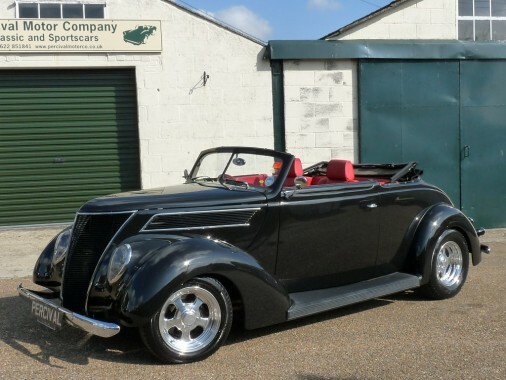 It is a 1937 Ford Club Cabriolet Hot Rod built by Kris Brown, a well known builder of these specials, for his own personal use using a body by RodLine. The engine is a IROC 350 Chevy lump with Lingenfelter fuel injection and a chipped ECU which pumps out in the region of 375 BHP and is mated to a 700 R4 four speed automatic gearbox. The chassis features reproduction chassis rails and the rest is engineered and fabricated. The suspension is Jaguar based front and rear and everything is beautifully constructed and works perfectly. The wheels are Budnik Formosas and the steering wheel is the same make. It has a stainless steel exhaust and a stainless petrol tank. A friend of mine, a enthusiastic and long term builder of rods, purchased the car ten years and completed the interior to a beautiful standard including fitting BMW front seats, central locking, a high end sound system and having the car trimmed to an exemplary standard. It has a heater, electric windows and there are seat belts fitted front and rear. This car drives beautifully, it sounds fantastic, it looks out of this world and yet it docile enough to go to Sainsburys but has serious performance if you so chose. We are told that it does 28 mpg on a run as well! Speaking of runs, the Ford has done 18,000 miles since it was built including many runs to Norway, Switzerland, Holland, Germany, and France as well covering a large part of the UK such is its ease of use and its reliability. This is a stunning machine which is beautifully built, drives superbly, sounds awesome and should upset your neighbours to boot!! Go On! Have some fun!!!!! !